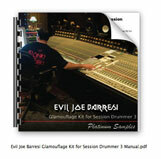 High resolution drum kit for Session Drummer 3 with up to 16 velocity levels and 4 round robin variations. Fully mix processed by Joe Barresi using his SSL console and outboard gear. Recorded by world famous recording engineer Joe Barresi whose credits include Tool, Bad Religion, Wolfmother, Soundgarden & Queens of the Stone Age. 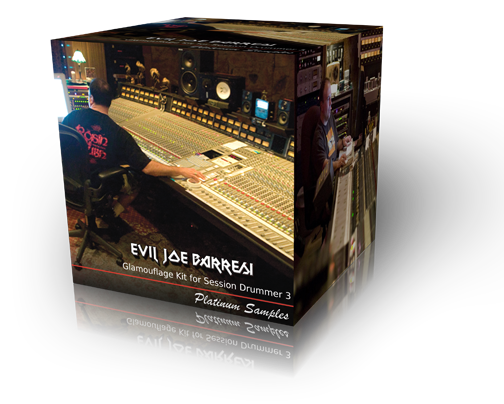 The Evil Joe Barresi Glamouflage Kit was recorded to analog 2" tape at Sound City Studios through their classic Neve 8028 console. Expertly tuned, the drums were played by Bobby Jarzombek (Halford). The Glamouflage Kit has been fully mix processed through Joe's SSL console and outboard gear. Pork Pie Glamouflage 10 x13"
Pork Pie Glamouflage 14 x16"
Pork Pie Glamouflage 16 x18"
Zildjian is a registered trademark of Avedis Zildjian Company. Platinum Samples is not affiliated with Avedis Zildjian Company or Pork Pie.